This elaborate suit of Japanese armor is a lightweight, form-fitting type designed to protect the body in close combat. With a face mask, forearm sleeves, thigh and shin guards, and bear-fur boots, every inch of the wearer’s body is protected. Craftspeople laced together hundreds of lacquered metal and leather plates with red and blue silk cords to create a distinctive appearance, as well as flexibility. 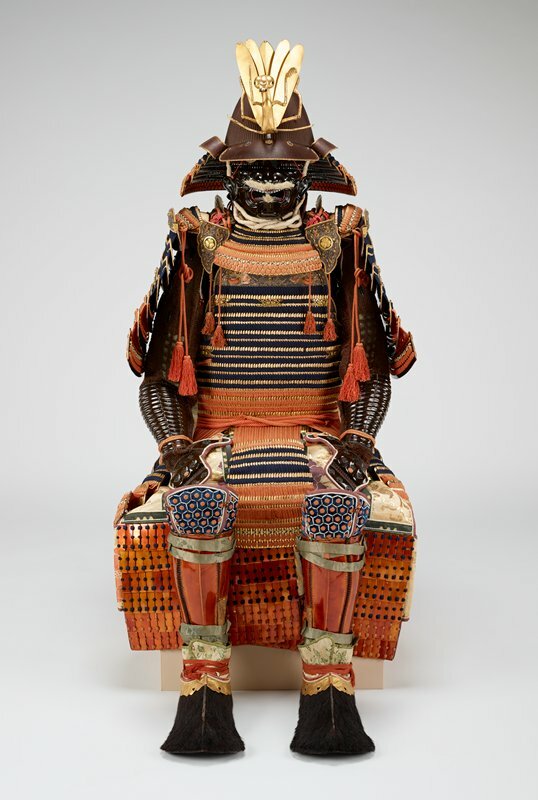 The suit may have belonged to Tokugawa Yorinobu (1602–1671), the feudal lord of Kii Province and founder of that branch of the Tokugawa family that ruled Japan until 1867. The suit could have been worn in battle but probably was only used for parades. Tokugawa family, Kii province (Wakayama Prefecture); Idemitsu Museum of Arts, Tokyo (1927-2009).